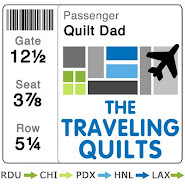 I always love hearing when my friends at the Fat Quarter Shop are planning on releasing another of their Shortcut Quilt patterns. One of their most popular Shortcut Quilts was the Jelly Roll Jam, and today they are releasing its long-awaited sequel: the Jelly Roll Jam II. I love working with pre-cuts but, to be honest, I've always been a bit stumped when it comes to jelly rolls. Having 2.5" strips of every print in a collection is wonderful, but I find it difficult to find good quilt patterns that use jelly rolls. Well, I'm here to tell you that this one is a winner. I started out with one jelly roll of Carolyn Friedlander's Botanics line (one of my faves) and, in less than 24 hours, I had this fun quilt. 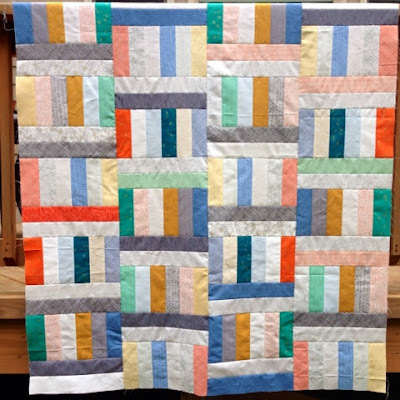 The pattern calls for splitting the jelly roll into 2 sets of strips and making two smaller quilts, but I decided to combine them to make one larger quilt. What can I say? 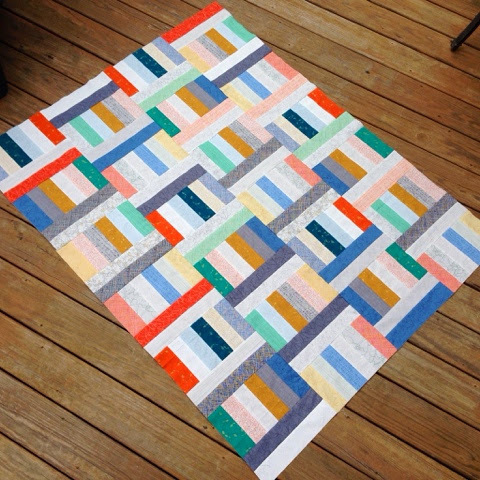 -- I like big quilts and I cannot lie. 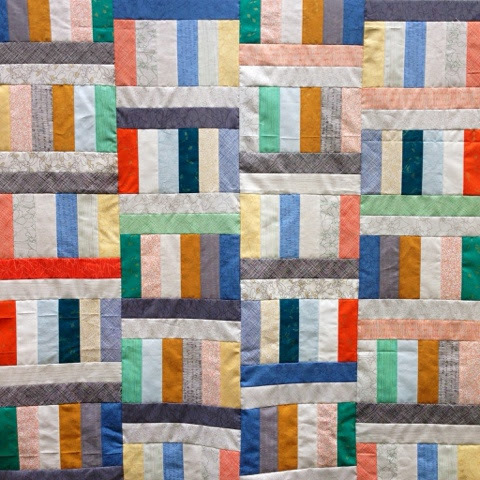 My Jelly Roll Jam II quilt is 4 columns across by 6 rows down. It used every strip in the roll -- exactly -- and produced very little waste. 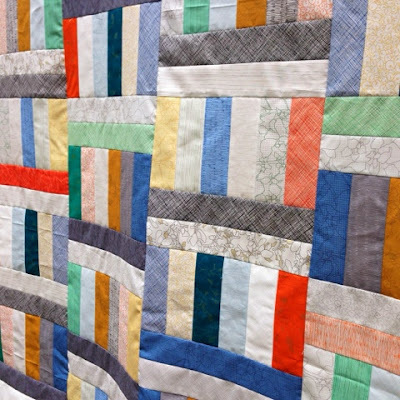 It measures approximately 48" x 60". I can't wait to finish this one up! As always, Kimberly and her team put up a great video to introduce the pattern, and the free PDF can be found here. 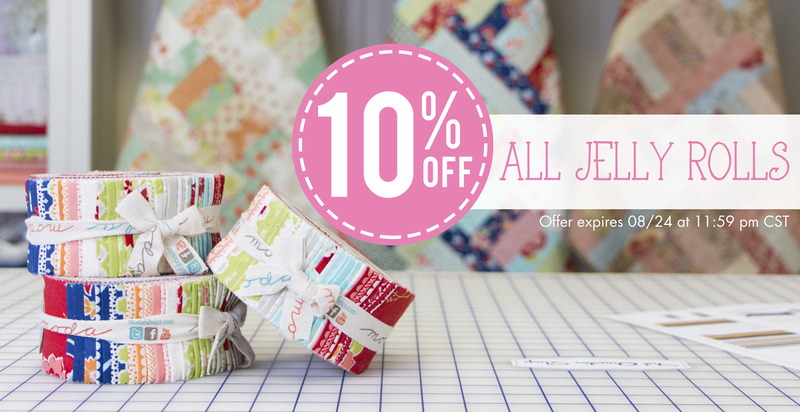 To celebrate the launch of the Jelly Roll Jam II pattern, the Fat Quarter Shop is offering 10% OFF all jelly rolls in their shop until August 24th, 2014 at 11:59 pm CST. So what are you waiting for? Pick your favorite jelly rolls today and start Jelly Roll Jammin'! I really love how the pattern shows off the colours of the Botanics. Deserved to be made bigger, it looks great! Love Botanics! 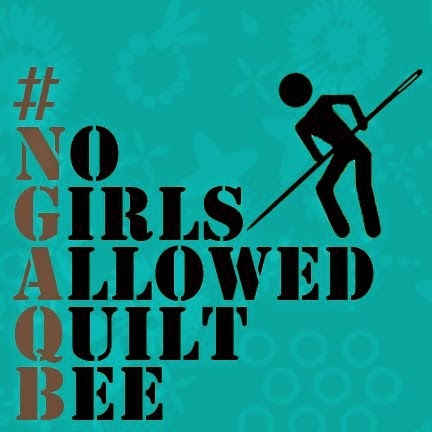 And love this quilt bigger:) No sense in lying, haha. I agree about the 2.5 inch strips, they always stump me. This is for sure a winner of multiple size choices ... even better!